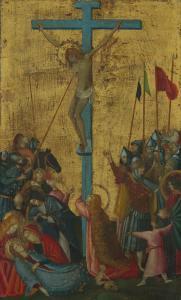 Find artworks, auction results, sale prices and pictures of Simone Martini at auctions worldwide. 14 1/8 by 8 1/2 in. 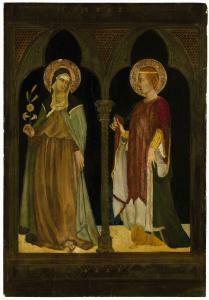 ; 36 by 21.5 cm. 11 1/2 by 8 1/8 in. 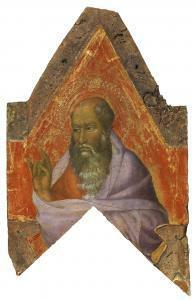 ; 29.2 by 20.6 cm. 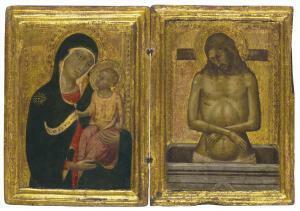 Manner of Simone Martini A diptych: left wing: The Madonna and Child; and right wing: Christ as the Man of Sorrows the left wing inscribed 'Ego su via ver...' (center, on the banderole) tempera and gold on panel 8 ½ x 12 1/8 in. 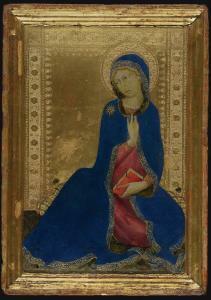 (21.6 x 30.8 cm.) Provenance Duke Pignatelli, Montedalvo, Naples. Enrico Frascione, Naples, where acquired in 1935 by the following with Knoedler, New York, where acquired in 1957 by George Stuart Heyer, Jr., Austin, TX.